Feature roles resumed for Spade after “SNL” gave him wide visibility: he played a cocaine addict in “Light Sleeper” and a beleaguered Republican nerd in the college-set satire “PCU.” He began a stint doing voiceover work on “Beavis and Butthead,” appeared on the comedy “Coneheads” and rejected Winona Ryder’s application as a fast food manager in “Reality Bites.” At the behest of “SNL” producer Lorne Michaels, who was nothing if not observant around the office, Spade was paired with his office mate and best friend, Chris Farley, in an unassuming movie produced by Michaels, “Tommy Boy,” where the two essentially played themselves. It was the project that elevated not only Spade to new levels of fame and appreciation, but made the duo an automatic comedy team overnight. “Tommy Boy” went on to be a cult classic. In 1997, Spade surprised many in Hollywood by taking a supporting role on an ensemble sitcom, “Just Shoot Me.” Spade dug into his small, snappy role as Dennis Finch, the snide office assistant for a fashion magazine. With a cast including George Segal and Wendie Malick delivering over-the-top comedic turns, “Just Shoot Me” was a certified hit and afforded Spade the most acclaim and exposure of his career up to that point. It developed a loyal following and served Spade’s talents well, showcasing his infamous wit while also giving him the opportunity to stretch by fleshing out his character. For his work, Spade would earn Emmy and Golden Globe nominations. After playing another snotty jerk — an entitled college kid — in the Marlon Wayans film, “Senseless,” Spade returned to Arizona to film his first HBO comedy special, “David Spade: Take The Hit.” Riffing on his painful childhood as well as his favorite pop culture targets, Spade’s return to form was well received. He made his screenwriting debut with the skewed romantic comedy “Lost and Found,” in which he also starred. Spade found success as an executive producer, working in that capacity on the Arizona-filmed, critically lauded independent “Jerome,” an understated tale of disaffected America co-starring Drew Pillsbury and his “Just Shoot Me” co-star Wendie Malick. Additionally, Spade lent his unmistakable voice to characters in the animated features “The Rugrats Movie” and “The Emperor’s New Groove,” which were both smash hits. Spade starred in and co-wrote 2001′s comedy “Joe Dirt,” playing a mullet-haired, trailer park-bred lovable loser who sets out on a road trip in search of his birth parents. The film was a moderate success and cult favorite. When “Just Shoot Me” ended, Spade penned and starred in another lead feature role in “Dickie Roberts: Former Child Star,” playing a thirty-something ex-Hollywood kid actor so desperate to keep himself in the entertainment industry game he hires a foster family to help him relive his childhood in hopes of winning a part. 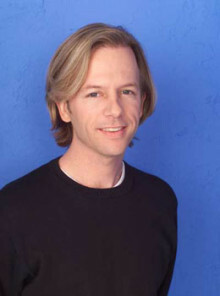 Reflecting the positive public and industry perception of his professionalism and reputation, Spade was tapped by ABC to step in with a recurring role on the sitcom “8 Simple Rules” following the death of series lead John Ritter. Solidifying Spade’s success in the mainstream consciousness, he was honored with a star on Hollywood’s Walk of Fame in 2003. He served as the host and producer of “The Showbiz Show with David Spade,” combining withering celebrity one-liners and increasing cultural interest in hard-edged gossip. With a fun, small role in the stoner-friendly “Grandma’s Boy,” a lead in the sports comedy “The Benchwarmers,” and an outlandish cameo in “I Now Pronounce You Chuck & Larry,” Spade’s career enjoyed a bump, and he found his next long-running role on the sitcom “Rules of Engagement.” Playing the foil to two couples navigating the ups and downs of relationships, the comedian seemed to have reached a new level with his acting, relaxed and comfortable, yet still able to steal a scene or skewer with a sharp one-liner. Spade then rejoined “SNL” chums Adam Sandler, Chris Rock and Rob Schneider as one of the leads in the summer comedy, “Grown Ups,” alongside Kevin James. He then reprised his role for the Summer 2013 release of “Grown Ups 2″. Do you want to hire David Spade? Directly request a quote. In 48 hours we can send you the availability of David Spade If you would like to book David Spade, Entertainment Booking Agency is the right place. We will offer you the best price and contact the management or we directly contact David Spade. For corporate appearances or speaking engagements you can contact our agents and the will help you true the process. Tags: hire David Spade, David Spade booking, book David Spade, David Spade appearances, find more information on booking David Spade for appearances, David Spade speaking engagements, David Spade endorsements/spokesperson, David Spade appearance fees, David Spade booking agency contact info, biography of David Spade, Contact an artist booking talent agent find a speakers bureau that can book David Spade, speaker booking agency for David Spade, David Spade booking agency, David Spade booking for corporate event. EBA is one of the biggest entertainment booking agencies in the World. We book hundreds of celebrities, artist, athletes and speakers in a year. Important to know is that we are not claiming to be the management of David Spade. We are not the official agent for David Spade. Companies from around the globe book these artists and speakers true our company be course we have one of the biggest networks and we always have direct contact with the artist or the management. We help you to find the right celebrities for your corporate of private events. Please contact one of our agents to get free advice and we will help to get the world-famous artist on your party.